A few months ago I switched jobs. For twelve years I’ve been an external information/IT consultant working for local governments. Now I’m working at the municipality of Wageningen doing the same work but as a civil servant in permanent service. Whereas I used to commute throughout the Netherlands to different organization, I now have a fixed office destination. I’m not a fan of commuting to work by car, mostly due to all the traffic jams – the Netherlands is heavily congested. I therefore am a big fan of using the public transportation, which is excellent in the NL and enables my to do work on my laptop on the train. Wageningen however is a lot more difficult to get to quickly from my hometown. It takes me about an hour and a half to commute to work. Even though it’s just 37 kilometres (23 miles). This is way too long for such a short distance IMO. By car it takes me, during rush hour, an hour and fifteen minutes, so a bit faster – but not by much. As a cycling nation I did consider the using a bike, but that would take me even more time. While orienting on this job a stumbled upon an alternative: the speed pedelec, also known as a high speed e-bike. So I did a bit more research about the speed pedelecs to see if this would be an interesting alternative and if it would actually be faster than public transportation and car. Short answer: yes! Here’s what I learned and experienced. I’ve written this with people who are novice to speed pedelecs (SPs) and considering buying one. A speed pedelec is an electrified bicycle which can assist your pedalling up to 45 kilometres per hour (28 mph). It differs from mopeds and scooters in that it has pedals and you actually have to pedal for the motor to kick in. The motor is allowed to amplify the power your legs deliver up to 4 times. Due to EU and national regulations a speed pedelec is required to have a license plate, horn, rear view mirror, lighting and its rider has to wear a special helmet. An insurance is also required. The speed pedelec depicted is a Stromer ST2. Picture was taken during my daily commute. The electric motor itself. On speeds pedelecs you see mid-drive motors and rear hub motors. Both have advantages and disadvantages. Mid-drive motors have their weight in the middle, it’s easier to change a tire and you can use a gates belt for instance. But a mid-drive also comes with its disadvantages, such as the effect it has on the durability of the drive train. You also can’t shift gears while pedalling. And mid-drive motors come tend to be less reliable. Apparently, this is due to the larger number of moving parts. Looking at user experiences and reviews on the internet I found noticeably more bad reviews on mid drive motors. So my first conclusion was to look for an SP with a rear hub motor. The power the motor delivers. On some SPs it’s noticeably easier to quickly reach the maximum speed AND to maintain it! The reviews showed me that some brands have even difficulty reaching the maximum allowed speed of 45 km/h (Trek, QWIC, Gazelle). Don’t be fooled by the usually higher torque you see on mid-drive compared to hubs, they are less effective to transfer this to the rear wheel. Due to regulations introduced last year in the Netherlands you are obliged to ride an SP on the road instead of the bicycle path. To not annoy car drivers and feel comfortable between cars it was imperative for me to be easily able to ride on maximum speed. Moreover, I was looking for an alternative to commuting by car of PT so I could get to work faster. Geometry and tire size. I did not expect the frame geometry and tire size could make such a huge impact on the ‘feel’ of riding on a speed pedelec, but it does. I tried several models from the same brand and experienced this myself. Bigger tire size (27,5” instead of 26”) does a lot for taking turns, dodging pot holes and stability (smaller tires tend to feel snappier, whereas bigger tires provide more stability). Battery size. Batteries tend to vary from 400 wh to a whopping 1300 wh. Depending on the energy consumption of the motor the range you can ride on a SP varies A LOT. My commute on a SP amounts to about 37 km (23 mi). So a big battery is a must. Consider also the effect cold weather has on the range you can ride and also consider a battery slowly but certainly degrades over time. So a battery as big as possible is a necessity for me. The front light. Also, this varies from brand to brand and from model to model. Think about it, when riding at maximum speed in the complete dark you need quite some light on the road in front of you, so you can see for instance pot holes long in advance. Take into account the reaction time to brake or perform a manoeuvre and I realized I needed a top notch light. One of the very best lights I stumbled upon is the Supernova M99 Pro which delivers 1100 to 1600 lumen (low beam – high beam)! Brakes, tires and gears matter a lot, but I noticed mostbrands use the same equipment from Magura, Schwalbe and Shimano. In the end one brand came up which stands out in reliability, speed, innovation (and price unfortunately); the Swiss brand Stromer! 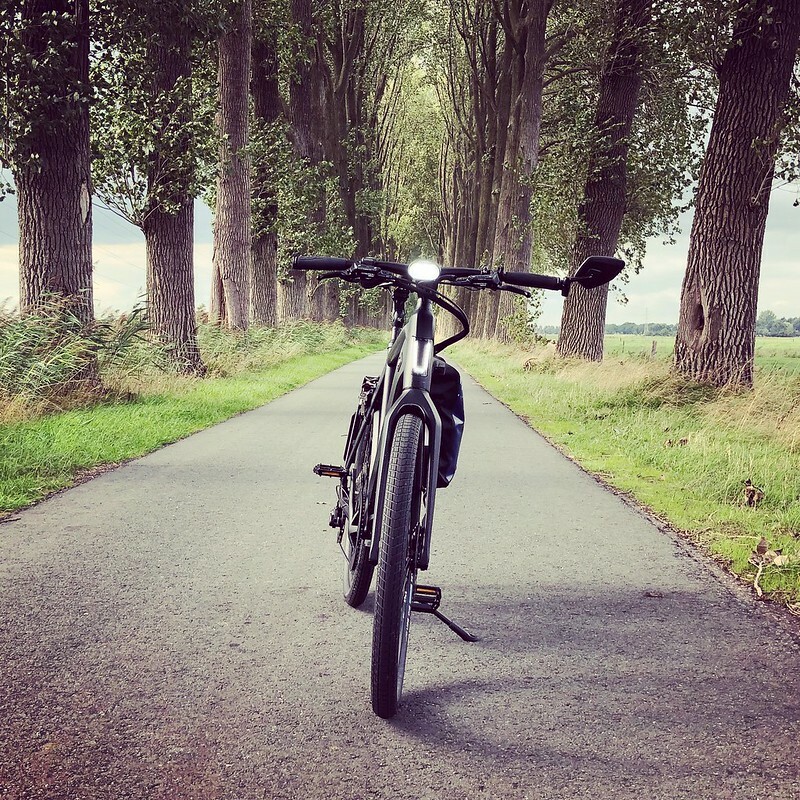 Stromer is the best sold brand of speed pedelecs in the Netherlands and has active online communities (Dutch, Swiss and American) where I could enormous amounts of experiences and advice. I found an excellent dealer nearby that has provided me with different Stromer models which I could then extensively test – the ST2 model I was even allowed to test for three weeks for commuting. I also tested the ST3 and ST5. In total I was able to ride a total of 1200 kilometres (750 miles) before I decided which model was for me. I’ll write other blog posts to tell more about the specific models. I’ll limit the rest of this post to focus on general observations and experiences. Speed pedelecs go very fast! My first few drives I was actually reticent to go full speed. But I quickly gained more confidence and started feeling comfortable to go 45km/h. The trick is know when, where and under which circumstances to go fast and when to restrain oneself. Roads with lots of pot holes, grit/gravel, bystreets and exits are not suitable for going fast. The biggest danger are the fellow road users who underestimate the speed of the speed pedelec. It has happened to me several times that cars overtake me and want to turn right on a side street with too little space. Luckily, I was prepared for this due to the online communities, having read people who had been in accidents with their SP. So I tend to drop my speed under such circumstances. If there is one thing I’ve come to understand, both by reading and by first-hand experience, the speed pedelec is long from a fully developed product and incomparable with a car or normal bike. Not only in the respect that brand are still innovating on a lot of the parts of the speed pedelec. But more importantly also in the negative side effect of new technology: reliability and stability. The electronics (especially the torque sensor, internal wiring and computer chips) are still prone to malfunctions due weather influences and other factors. A lot of SPs experience these problems upon delivery and during the first few weeks and a good dealer solves them, after which most people have a problem-free SP. I was prepared for some issues when I got a test-SP and unfortunately some issues have indeed occurred. I then quickly learned how important a good pro active dealer is (and I was not disappointed by the dealer I had chosen). So some buying advice: don’t go for the cheapest dealer but the best one you can find within a reasonable distance. You may depend on them (especially in the first weeks) more than you expect. Oh my, I have come to really appreciate the looks of the SPs I’ve been testing. The big and wide tires I really like because it gives a SP a tough look. I received a lot of positive reactions and the SP got a lot of admiration whenever I stopped at a traffic light or a bicycle ferry. Most people ask the three how-question: how fast is it, how far can you ride with it and how much does it cost. Usually in that order. When people hear the cost of an SP their enthusiasm tends to diminish somewhat. Though I explain I see this as an alternative to buying a car which makes it financially very interesting (I know, this is in part cognitive dissonance). A speed pedelec is certainly not cheap. Expect prices ranging from 3.000 euros up to 10.000 euros (about $3.500 – $11.500). When compared to a bike this certainly a lot of many – and in itself it’s of course a lot of money as well. Bu I’ve come to see of it as an alternative means of transportation instead of a car of train. And then the difference total cost of ownership are actually quite good. A SP basically costs you a lot of money initially, but regular maintenance is quite cheap: tires, chain, drive train, brake pads and some oil and stuff and that’s it. Electricity for charging the battery is minimal, I’ve estimated it will cost my about €20,- a year ($23). Not bad, ey? A car is significantly more expensive when considering total cost of ownership. Initial price of a car could very well be cheaper, but think of all the recurring bills: petrol, road tax, insurance, parking fees and maintenance. During the second year an SP is getting cheaper than a car and in the third year I’ll reach break-even in respect to my travel allowance. From then onwards, the SP actually makes money! After extensively testing the SP on the daily commute I found the perfect route through farm lands and forest, mostly avoiding towns and traffic lights. It takes me an hour exactly! So this is way faster than the car and PT. I have found the perfect means of transport! But, more aspect make it perfect for me: A ride on a SP puts a smile on my face every single time (even when riding with heavy rain). It is such a pleasure to ride on a SP through lovely landscape. It also provides me with a great workout (I shower at work). And lastly, every single day I came home with a head completely freed from contemplations about work. In the end these factors have persuaded me to order a Stromer speed pedelec; it is set to be delivered in early december. More about Stromer speed pedelecs in future blog posts and how I came to my decision which one to order. In de podcast is hij in gesprek met Matt Drance, een voormalig Apple-medewerker met de functie van ‘evangelist’. De podcast geeft enkele interessante inkijkjes in de begindagen van de iPhone. Stephen Aquino schreef gisteren een interessante blogposting over wat FaceID betekent voor mensen die baat hebben bij toegankelijkheidsopties. Stephen die zelf loenst werpt een interessant perspectief op hoe Apple in haar design goed rekening houdt met fysieke beperkingen. Een onderbelichte kracht van Apple waar de gemiddelde gebruiker nooit bij stilstaat. Sinds 3 dagen heb ik de nieuwe iPhone X in mijn bezit. Hieronder mijn eerste ervaringen met deze nieuwe iPhone X en hoe deze zich verhoudt tot de iPhone 7 plus. Bij het openmaken van de doos valt mij op; Deze iPhone is duidelijk anders dan alle iPhones die eraan voorafgingen. Tegelijkertijd is het direct ook onmiskenbaar een Apple-product. De glazen achterkant is smaakvol ontworpen. De stalen glimmende zijkant, van de zilveren editie die ik heb, is echt schitterend en glimmend afgewerkt. Het ziet er futuristisch uit en doet mij gelijk denken aan de stalen Apple Watch 2. Het kleinere formaat van de iPhone is een groot voordeel ten opzichte van mijn iPhone 7 plus. Ik kan de X beter vasthouden en een groter deel van het scherm met een hand bedienen. Dan moet ik natuurlijk iets zeggen over de twee grootste vernieuwingen aan deze iPhone: FaceID en het OLED-scherm. Het instellen van FaceID gaat veel sneller dan het opzetten van TouchID. Twee keer je hoofd bewegen is voldoende om direct van start te gaan. Ik blijk nogal eens mijn andere hand bij mijn mond/kin te houden. FaceID herkent mijn gezicht dan niet. Zodra ik mijn hand weghaal logt de X alsnog in. Als ik de X op mijn nachtkastje heb liggen en ik wil liggend in bed mijn wekker zetten, dan kan de iPhone mijn gezicht niet vinden omdat ik praktisch op gelijke hoogte lig. Sterk tegenlicht interfereert met het scannen van mijn gezicht, waardoor de iPhone X duidelijk meer moeite moet doen om mij in te loggen. Een enkele keer moest ik wegdraaien van het tegenlicht. FaceID geeft mij meer gebruiksgemak dan TouchID. Vooral als je sport of in slecht weer de iPhone wil openen is het fijn dat vocht op je vingers niet langer het inloggen bemoeilijken. En wanneer ik een sjaal om heb hindert dit de werking van FaceID niet. Hier is gezichtsherkenning duidelijk in het voordeel. Met FaceID ervaar ik het inloggen weer zoals het in begintijdperk van de mobiele telefoon was. Het geeft de ervaring dat je geen pincode hebt. Dat voelt nog wat onwennig; de animaties die vergezeld gaan van FaceID heb ik nodig om een gevoel van veiligheid en grip te krijgen. De eerste dag had ik nog de neiging om te wachten en te kijken totdat het slotje ontgrendeld was op het lock-scherm voordat ik omhoog swipete. Zoals al meer reviewers op internet constateren, FaceID is niet zo snel als de tweede generatie TouchID. Het is wel sneller dan de eerste generatie TouchID. Tip: De truc is om snel in te loggen door meteen het scherm aan te raken met je vinger en deze gelijk naar boven swipen. Je drukt dus niet de zijknop in en wacht ook niet op het ontgrendelen van het slotje. Dit levert aanmerkelijk snelheidswinst op zodat de totale ‘inlog-ervaring’ niet wezenlijk langer duurt dan met TouchID. Daarmee kom ik op een kleine innovatie die deze iPhone X als eerste iPhone heeft: Door het scherm aan te raken activeert de iPhone, net als de Apple Watch dat doet. Je hoeft dus niet de zijknop o.i.d. in te drukken om het scherm te activeren, zoals bij oudere iPhone. Deze iPhone is de eerste met een OLED-scherm. Op het eerste gezicht valt dit verschil niet eens heel erg op. Het eerste wat me op ging vallen is het kijken naar het scherm onder een hoek. Je ziet onmiskenbaar een blauwige gloed over het scherm zodra je naar het scherm kijkt bij een kleine hoek. Het is niet storend maar valt wel duidelijk op. Ik lees op internet dat dit een typisch OLED-verschijnsel is en dat andere OLED-smartphones hier zelfs meer last van hebben. Het voordeel van OLED zie ik met name zodra ik op Youtube of Netflix een film met donkertinten bekijk; dan zie ik overduidelijk de meerwaarde van OLED. Bij apps die nog niet geschikt zijn gemaakt voor de iPhone X zie je onder en bovenin zwarte balken, waardoor de ‘notch’ (uitstulping bovenin waar de FaceID-sensoren zich bevinden) volstrekt niet opvalt. Na enige gewenning aan de notch moet ik toegeven dat ik apps die het volle scherm benutten er toch mooier vindt uitzien, ondanks dat de notch zichtbaar is. Dat het scherm naast de notch aan beide kanten helemaal tot bovenin loopt voegt dus blijkbaar een waarde toe, die ik als gebruiker kan waarderen. Toch zijn er met het nieuwe scherm ook wel wat issues. De beeldverhouding is gewijzigd (19,5 bij 9 ipv 16 bij 9) en daardoor langwerpiger dan andere iPhones. Je ziet bij sommige apps dat onderaan in navigatiemenu’s teksten wegvallen of wat rommelig ogen door het smallere beeld. Bij youtube wordt video standaard weergegeven in de normale verhouding, dit betekent dat het beeld niet reikt tot aan de notch. Door dubbel op een video te drukken gaat de video full screen en wordt de notch zichtbaar in de video. Het enigszins storende is niet de notch, maar dat het ingezoomde beeld in panoramamodus de boven- en onderkant van de video wegsnijdt. Als laatste wil ik over het scherm nog kwijt dat ik erg blij ben met de toevoeging van ‘truetone’. Dit is een functie die Apple eerder in de iPad pro introduceerde en waar ik zeer ben gaan waarderen. De functie voorziet erin dat wittinten altijd matchen met het omgevingslicht waarin je je bevindt. Het is een subtiele functie waarvan je de werking pas opvalt als je hem uitzet of een scherm ernaast houdt zonder true tone. Als ik met mijn iPad Pro en iPhone 7 tegelijk bezig was viel het blauwige scherm van de iPhone in negatieve zin op. Ik wachtte dan ook met smart op deze functie bij de eerste iPhone. Mijn verwachting was dat het nog een extra jaar zou duren eer we dit in een iPhone konden aantreffen. Door al het glas op deze iPhone X weet je wel direct dat je met een kwetsbare smartphone van doen hebt die snel beschadigt. Het is om die reden dat ik ditmaal voor een hoesje heb gekozen. Omdat ik het gezeul met losse portemonnee zat was heb ik de iPhone X voorzien van Apple’s Folio hoesje in donkerblauw (Kosmosblauw). Eerlijk gezegd valt het saaie uiterlijk mij enigszins tegen. Het is niet wat ik voor de prijs van €109,- had verwacht. Praktisch is het hoesje wel omdat je er ook pasjes in kwijt kan. Ik heb nu mijn OV-, bank- en ID-pasjes in het hoesje zodat ik mijn portemonnee kan thuislaten. Ook geeft het hoesje een veilig gevoel dat mijn dure smartphone goed beschermd is tegen valschade. Het hoesje heeft nog een aardige feature die we al vanaf de begindagen van de iPad gewend zijn: Het dichtklappen van het hoesje zet de iPhone in slaapstand, het openklappen activeert vervolgens het scherm weer. Dit is mogelijk dankzij een zwakke magneet in het hoesje. Let wel op met pasjes waarschuwt Apple; de magneet kan je pasje onbruikbaar maken. Door de pasjes aan de binnenkant van het hoesje te stoppen zijn de pasjes blijkbaar afdoende beschermd. Dat blijkt ook uit mijn ervaring, de pasjes werken nog gewoon na een paar dagen gebruik. De nieuwe swipe gebaren kostte mij eerlijk gezegd geen enkele moeite om aan te leren. Het blijkt eerder moeilijk om de oude gebaren op een oude iPhone te maken! Er zitten trouwens kleine subtiele verschillen in de speciale schermen die iPhone X laat zien ten opzichte van andere iPhone die iOS 11 draaien. Zo laat het meldingenscherm geen inhoud van meldingen zien tenzij de FaceID-sensoren registreren dat je actief kijkt naar het scherm. Dit is een hele mooie innovatie die een licht laat schijnen op wat de mogelijkheden zijn die FaceID-sensoren bieden aan de gebruikerservaring. Ik denk dat we op dit vlak nog meer kunnen gaan verwachten. Het unlock-/meldingenscherm toont de zaklamp en camera-icoon onderin. Je moet hierop 3d-touchen om ze activeren, de trilling is goed gekozen omdat het de indruk geeft dat je een knop indrukt. Het is nog te kort om echt alles te reviewen van de nieuwe iPhone X, maar ik moet zeggen dat de eerste indrukken zeer positief zijn. Apple heeft een supermooi en compleet toestel afgeleverd dat vertrouwd en toch innovatief is. Als ik tot meer inzichten kom volgt een nieuw artikel. Sinds twee dagen ben ik de trotse eigenaar van de nieuwe iPad Pro 10,5 inch. Met de WWDC vorige maand was ik blij verrast met de aankondigingen die Apple deed rondom iOS en de iPad. En wel genoeg om, naast de aanschaf van een nieuwe 27″ iMac, ook serieus een iPad te overwegen. Met het zelf uitproberen van de beta iOS 11 op mijn oude iPad mini 2 was ik om. Hieronder een beknopte eerste recensie met mijn eerste indrukken van deze krachtpatser. Toen ik deze week de eerste keer de iPad Pro 10.5 in een winkel zag liggen, dacht ik dat ik met de 12,9″ van doen had; het grotere scherm met dunnere randen oogt direct veel groter dan de 9,7″ met dezelfde omtrek/afmetingen. De geroemde Promotion-functie van het nieuwe scherm vond ik persoonlijk minder spectaculair op eerste gezicht. Wat mij vooral trof was de scherpte, kleurdiepte en bizarre helderheid van het scherm. De iPad die ik tot dusver zo af en toe gebruik is de inmiddels verouderde iPad mini 2. Er zijn nogal wat verschillen tussen de oude mini en deze nieuwe Pro zodat het eigenlijk geen eerlijke vergelijking is. Toch zal ik net als velen die deze Pro zullen kopen de overstap maken van een al wat oudere iPad. Dit omdat iPads gewoon lange tijd hele fijne apparaten zijn die je niet elke twee/drie jaar vervangt. Het belangrijkste verschil is toch wel de snelheid. Alles is zó snel en responsief dat alle input volledig realtime plaatsvindt. En wel zodanig dat de iPad sneller lijkt dan mijn MacBook 2015 en nieuwe iMac! Dit maakt het gebruiksplezier zo groot dat ik niet meer terug wil naar de oude iPad mini en nu op de bank zittend direct de voorkeur geef aan de iPad pro boven mijn MacBook. De nieuwe iPad verrast op een aantal vlakken. Naast de snelheid is het fenomenale geluid uit de vier speaker opvallend. Het geluid komt echt zuiver en ruimtelijk uit de vier speakers. Je kan hier uitstekend muziek op luisteren. Ook verrassend is de feature die Apple ‘true tone’ noemt; met sensoren bepaalt de iPad de meest neutrale en natuurlijke kleurtint van het scherm. Je merkt hier eigenlijk niks van, tótdat je het uitzet of bijvoorbeeld het scherm van je iPhone bekijkt.Je ziet dat zonder truetone het scherm flets en onnatuurlijk eruit ziet. Wederom een subtiele maar hele fijne feature die ik liefst direct op al mijn Apple apparatuur (en tv!) wil. Helaas vereist true tone sensoren die niet op iPhones of macs te vinden zijn. Het nieuwe formaat van 10.5 inch is door Apple echt perfect gekozen. Het is toch een heel verschil met een 9.7 inch. Ik vind het formaat groot genoeg om prettig mee te werken. Ik kan me zelfs voorstellen dat ik er hele werkdagen fijn op kan werken. Ik ben blij dat ik de 12.9 niet gekocht heb; die vind ik té groot en zwaar om fijn te hanteren, zeker als je de iPad los in de hand gebruikt. Wat me opvalt is er nog wel apps zijn die minder mooi schalen op het nieuwe formaat. Bij de Nu.nl app valt me dat bijvoorbeeld in het bijzonder op. Bij andere apps ziet het er wel heel mooi en natuurlijk uit;dat heeft alles met de appontwikkelaar te maken. Vallen er dingen tegen aan de iPad Pro? Aan de iPad zelf eerlijk gezegd (nog) niet. Aan de accessoires echter wel; ik heb het nieuwe Apple smart keyboard gekocht. Die is met €179,- ronduit duur te noemen. Het typen vond ik even wennen, maar werkt op zich best fijn. Wat ik echter onhandig aan het keyboard is het opvouwen en ontvouwen. De magneet is best sterk en het keyboard klopt snel weer in wanneer ik hem probeer te ontvouwen. Zal misschien wennen zijn, maar het stoort me nu wel. Ook merk ik dat op de bank met het toetsenbord bevestigt aan de iPad niet fijn typt als je de iPad + keyboard op schoot hebt liggen. De kijkhoek en het typen lukken dan niet goed. Het keyboard is echt als je aan tafel zit of eventueel als je rechtop in eens stoel zit werkbaar. Fijn aan het keyboard is trouwens dat de toetsen dicht zijn; er kunnen geen kruimels of water tussen de toetsen komen. Ik heb ook een Apple pencil aangeschaft. Ik heb er nog te weinig mee gedaan om er echt een mening over te vormen. Eerste indruk is dat het echt realtime interacteert met het scherm, vrijwel gelijk aan het werken met pen en papier. Koppelen van de pencil met de iPad doe je de eerste keer overigens door de lightningaansluiting op de kop van de pencil in de lightningpoort van de iPad te steken. Vanaf moment zijn ze met elkaar verbonden. Best vernuftig! De belangrijkste reden om de iPad pro aan te schaffen is de enorme functierijke upgrade die iOS met zich mee brengt. Ik heb iOS 11 public beta 1 en nu 2 al enkele dagen op de iPad mini, dus heb als iets kunnen proeven van het werken met deze nieuwe versie. Zodra ik wat ervaringen heb opgedaan met iOS 11 op de pro volgt een nieuwe blogupdate. Tegen alle verwachtingen in zijn de AirPods nog voor de Kerst bij mij thuis bezorgd. Ik bestelde ze vanaf de eerste dag dat ze te bestellen waren. Ik was echter ‘aan de late kant’; zo’n drie uur nadat bekend werd gemaakt dat ze te bestellen waren. De store gaf aan dat ik ze niet op 29 december op de deurmat kon verwachten. Gisteren kreeg ik echter een onverwachtse update via de Store-app; ze zouden vandaag (de 21e) bezorgd worden. Eerste indrukken: Zoals we inmiddels gewend zijn van Appleproducten zijn de AirPods elegant doch simpel verpakt. In het doosje zitten twee AirPods, een oplaaddoosje (case) en losse lightningkabel (zonder oplader). De case ziet er mooi glimmend uit, maar doet qua vorm denken aan een doosje waarin ook flosdraad zit. De AirPods zelf zijn solide gebouwd en met name de dikke ‘steel’ en het juiste gewicht (iets zwaarder dan ik had verwacht) geven mij het gevoel dat ik met een kwalitatief goed product van doen hebt. De magneet van het klepje op de case zelf, evenals de magneet die je ervaart wanneer de AirPods in de case glijden, zijn behoorlijk sterk. Ik kan alleen maar zeggen dat Apple hierin weer oog heeft gehad voor de kleinste details; it just feels right! Het verbinden gaat uiterst simpel; klap de case open en een scherm verschijnt op je iPhone. Zodra je verbind doen ze het meteen. Overigens doen ze het dan ook meteen op alle andere Apple-producten die aan hetzelfde iCloud-account zijn gekoppeld zoals Apple Watch, Macbook en iPad. Met mijn Macbook dit ook al even gecheckt. Ik heb de AirPods nu zo’n anderhalf uur in gehad en ze irriteren niet in mijn oren. Ze zijn dusdanig licht dat ik niet merk dat ik ze in heb. Qua geluid meen ik te horen dat ze iets beter klinken dan de traditionele bedraadde EarPods. Ik heb ook al even gebeld met iemand en vertelde me dat ik kraakhelder te horen was. Mooi is dat zodra ik de AirPods in heb en muziek afspeelt, ze meteen pauzeren zodra ik er een uit mijn oor haal. Stop ik de AirPods terug in mijn oor en de muziek hervat meteen. Als ik op mijn iPhone het geluid zachter wil zetten dan gaat het volume van de AirPods daadwerkelijk zachter; het werkt intuïtief zoals je dus zou verwachten. Het enige dat ik niet intuïtief vind is waar de instellingen van de AirPods te vinden zijn. Ik had eerlijk gezegd verwacht dat er via het Instellingenmenu een apart tabje zou ontstaan voor de AirPods. Ik moest echter even zoeken op internet om te vinden waar je de instellingen kunt vinden: via Instellingen —> Bluetooth —> AirPods. Hoewel logisch voor andere Bluetoothapparaten had ik blijkbaar intuïtief de verwachting dat ze makkelijker te vinden zouden zijn. Zo nu eerst maar eens verder plezier hebben en ervaring opdoen met de AirPods. Zodra ik heb hardgelopen met de AirPods zal ik mijn verdere bevindingen delen. Inmiddels heb ik de iPhone 7 Plus een volle week in mijn bezit. In deze review geef ik je mijn eerste (en tweede) indrukken en advies of de aanschaf van deze iPhone de moeite waard is. Ik heb bewust even gewacht met het schrijven van deze review om het toestel goed te leren kennen en te wennen (of juist niet) aan de veranderingen. Je zal van mij geen unboxing video voorgeschoteld krijgen (Er zijn er tenslotte genoeg te vinden op internet). Toch wil ik wel even bij het uitpakken van de iPhone stilstaan. Elke Apple-aanschaf is altijd een bijzonder moment en zoals je elders ook kunt lezen op internet; Apple besteedt veel aandacht, geld en tijd aan de verpakkingen en de gebruikerservaring die daar bij komt. Ook nu was het weer een plezier om de iPhone uit te pakken. Ik heb ditmaal de iPhone besteld met een abonnement van KPN. 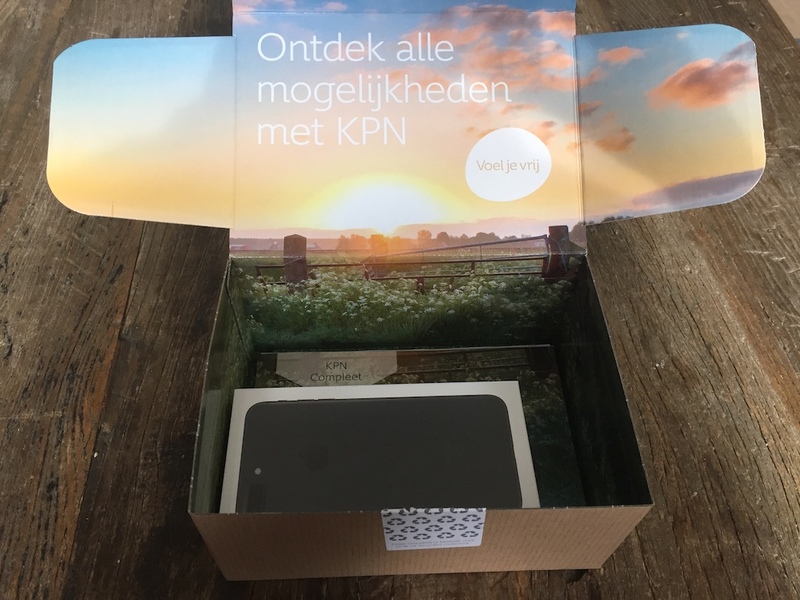 Ook KPN neemt de gebruikerservaring van het uitpakken serieuzer dan ik van hen tot dusver gewend was; Als je het neutrale kartonnen pakket opent dan zie je een vrolijkmakende landschapsfoto met zonnetje. Bij het uitpakken valt op dat Apple niet langer een mooi doosje levert bij de oordopjes. Dit zit nu in een kartonnetje. Hoewel karton, is de verpakking nog steeds netjes gemaakt. Aan de achterkant zit het verloopje van audiojack naar lightning. Alles is makkelijk en op elegante wijze uit de verpakking te halen. Een verademing in vergelijking met zoveel andere electronicafabrikanten die volstrekt geen aandacht aan deze uitpakervaring besteden. Om te beginnen met kleur: De laatste twee iPhones waren zilver met een witte schermrand. Omdat ik inmiddels ook dikwijls Netflix op mijn iPhone kijk, leek een zwarte schermrand mij rustiger om naar te kijken (films/series hebben toch veelal donkere kleuren). Dan zijn er nog twee opties: de matzwarte iPhone of de gitzwarte (Jet Black) iPhone. Hoewel ik de gitzwarte er erg mooi uit vind zien, heb ik om twee redenen toch voor de matzwarte uitvoering gekozen. 1) Ik doe altijd een hoes om mijn iPhone dus die prachtig glimmende gitzwarte achterkant zou ik nooit zien. 2) De levertijd van de matzwarte is gewoon veel beter (zelfs nu nog op moment van schrijven). Alsnog heb ik al met al best even moeten wachten voordat de iPhone op de deurmat lag, maar met de gitzwarte uitvoering had ik er nu nog niet eentje in mijn handen gehad. Dan de opslag: Dit was voor mij eigenlijk de makkelijkste keuze om te maken. Ik heb er een goed gebruik van gemaakt om altijd voor de middelste optie te kiezen. In dit geval de 128 Gb. Hoewel 64 Gb genoeg was geweest heb ik toch voor de 128 Gb moeten kiezen, want die variant is er bij dit model helaas niet. De 32 Gb zou voor mij echt te klein zijn. Ik maak veelvuldig foto’s en heb de nodige grote apps geïnstalleerd staan zodat ik binnen no time met een volle iPhone zou kampen. Daarom 128 Gb. Tot slot het formaat: Dit was de lastige keuze om te maken. Ik had geen ervaring met een Plus-model. Aangezien ik vrij kleine handen heb en ik met het 4.7 formaat van de iPhone 6 al stoeide, had ik hier mijn vraagtekens bij. Ook loop ik veel hard en neem dan vaak mijn iPhone mee, dus ook gewicht speelde mee. Aan de andere kant was de beloofde Bokeh feature wel erg aanlokkelijk voor een hobbyfotograaf zoals ik. Dit is eigenlijk voor mij een van de twee doorslaggevende overwegingen geweest om voor de Plus te kiezen. Accuduur is nog een overweging geweest. De 5.5″ Plus heeft een betere accuduur dan de 4.7″ variant. Wat bij mij vooral veel accu opslurpt is het veelvuldig gebruik van de hotspotfeature waarmee ik mijn laptop in de trein en vaak tijdens bezoeken aan klanten van WiFi voorzie. Een andere overweging is het type gebruik. Ik ben in de loop der tijd mijn iPhone steeds intensiever maar vooral ook anders gaan gebruiken. Waar ik vroeger de iPhone veel zakelijk gebruikte (mail, agenda) en hier en daar een app gebruikte (OV-apps, spelletjes), doe ik nu veel meer websites bezoeken via Safari en ‘multimedia’ consumeren: Netflix, Spotify, Podcasts, maar ook boeken via de iBooks/Kindle/Bol.com app. 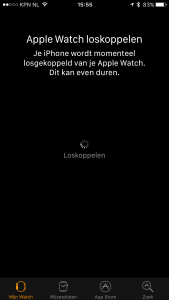 Video’s kijken en hele boeken lezen op de iPhone gaat gewoon fijner op een groter scherm. Nu weet je mijn overweging om voor een matzwarte iPhone 7 Plus met 128 Gb te kiezen. Dan nu beknopt mijn eerste indrukken. Zoals gezegd, met een (helderblauwe leren) hoes van Apple zie je weinig van de matzwarte kleur. Maar voordat de hoes eromheen ging heb ik de kleur wel goed bestudeerd. Ik moet zeggen dat het een erg fraaie kleur is. De kleur is ook prachtig uitgevoerd. Als je in de lightningpoort kijkt zie je dat die ook helemaal matzwart is. Zelfs de SIM-tray is in het matzwart. Hoewel waarschijnlijk minder dan bij de gitzwarte uitvoering, zie je ook op het matzwart direct vingerafdrukken. Het is niet storend, maar je ziet ze wel duidelijk. Voor mij in ieder geval geen showstopper vanwege het hoesje dat er toch omheen zit. Het eerste wat mij opviel tijdens het uitpakken was het gewicht. De Plus is voelt best zwaar aan in vergelijking met mijn oude iPhone. In de eerste uren werken met de Plus constateer ik dat het vrijwel onmogelijk is om comfortabel met één hand de iPhone vast te houden én gelijktijdig te bedienen. In de dagen die erop volgden merkte ik dat ik er snel gewend aan ben geraakt. Ik merk eerlijk gezegd niet meer dat ik nu twee handen gebruik in plaats van een. Een iPhone met twee handen bedienen is dus voor mij geen dealbreaker. Het lezen en kijken van een 5.5″ scherm is echt fantastisch. Het is alles wat ik ervan verwacht had en meer. Ook het typen gaat nog fijner dan op een 4.7″ scherm. Een verrassing bij de 5.5″ is dat het homescherm, waarop alle apps staan, in landschapsmodus komt wanneer je de iPhone een kwartslag draait. Net als je bij een iPad gewend bent. Hoewel ik het nut ervan nog niet ervaren heb, verraste dit me wel. De kwaliteit van het scherm is nog iets dat mij direct bij het eerste gebruik in positieve zin opviel. Al bij het opstartscherm van iOS, waarop een wit Applelogo tegen een zwarte achtergrond is afgebeeld, leken de randen nog scherper en meer contrast te hebben dan ik gewend was. Ook in het verdere gebruik merk ik dat de kwaliteit van de kleuren en contrast fenomenaal is. Zozeer zelfs dat ik eerste meende dat er iets mis was met mijn ogen toen ik na een paar uur werken op de iPhone op mijn zakelijke smartphone (Microsoft Lumia 650) op het OLED scherm. Ik zag de pixels op de letters zitten en geen mooie scherpe contrasten tussen de witte letters en donkere achtergrond. Toegegeven, dit is een goedkope smartphone voor een fractie van de prijs. Maar mijn punt is dit: het verschil in kwaliteit viel me ineens veel meer op dan toen ik de iPhone 6 gebruikte. 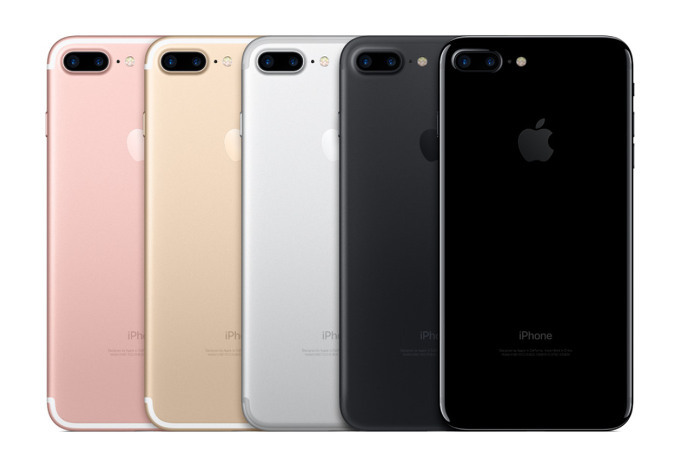 Apple roemt het bredere kleurenspectrum dat de iPhone 7 nu kan weergeven. Daar heb ik eerlijk gezegd nog niet (bewust) verschil in gezien. Dat heeft ook alles te maken met het feit dat ik nog weinig achtergrond of foto’s heb kunnen vinden die hier gebruik van maken. Met de camera, die ook vastlegt in dit bredere kleurenspectrum, heb ik nog onvoldoende foto’s gemaakt om echt het bredere kleurenspectrum op waarde te kunnen schatten. Zoals je aan de vele reviews kunt aflezen; de nieuwe haptische niet-fysieke homeknop maakt heel wat los bij Apple-enthousiasten. Ik heb er serieus aan moeten wennen, maar na een week kan ik zeggen dat ik gewend ben. Sterker nog, de oude homeknop op de iPhone 6 voelt nu vreemd. Je kan de mate van haptische feedback overigens instellen in drie standen in oplopende intensiteit. Ik begon met stand 3 omdat ik initieel toch zocht naar iets dat zoveel mogelijk op de oude vertrouwde mechanische homeknop lijkt. Inmiddels ben ik daar vanaf gestapt en staat de knop nu op stand 1 ingesteld. Met de knop merk ik dat de touchID ineens veel sneller en accurater werkt. Ik denk dat dit op de eerste plaats komt door de extra rekenkracht die de iPhone 7 herbergt. Maar dat is, naar mijn idee niet het hele verhaal. Als ik vochtige vingers heb, door water of zweet, dan is de homeknop veel vergevingsgezinder dan de iPhone 6. Ik meen me te herinneren dat de 6 nog de eerste-generatie-touchID-sensor heeft. Sinds de 6s is er volgens mij een tweede-generatie-sensor door Apple ontwikkeld. Apple heeft uitgelegd dat zij van een trilmotor zijn overgestapt op een haptische sensor. iOS 10 maakt daar dankbaar doch subtiel gebruik van. Apple heeft dit weer tot in perfectie ontwikkeld; de haptische feedback is een voltreffer! Als je naar beneden of opzij scrolt in menu, een letterkeuzerij in het toetsenbord, of een draaischijf voor tijd/datum, dan voorziet de iPhone je van subtiele haptische feedback. Wanneer je bijvoorbeeld aan het eind van een scrolmenu bent beland krijg je nu zeer subtiele haptische feedback. Het voelt zo natuurlijk en prettig dat het lijkt als het er altijd al is geweest. Het draaien aan een draaischijf geeft een geweldige klik-klik-klik trilling die heel realistisch aanvoelt. Het lijkt zelfs, maar misschien is dat enkel de visuele ondersteuning die deze illusie creëert, dat de haptische trilling daadwerkelijk de richting op beweegt waar je heen scrolt. Nog voordat ik mijn nieuwe iPhone kreeg had ik al wel iOS 10 in gebruik op mijn oude iPhone. Daar kwam ik voor het eerst in contact met het verdwijnen van de befaamde ‘slide to unlock’ die er sinds de eerste iPhone al was. Het extra (dus 2x) indrukken van de homeknop was voor mij wel erg wennen en voelde onnatuurlijk; het is niet “des Apple’s”. Pas bij mijn nieuwe iPhone werkt dit beter en natuurlijker. 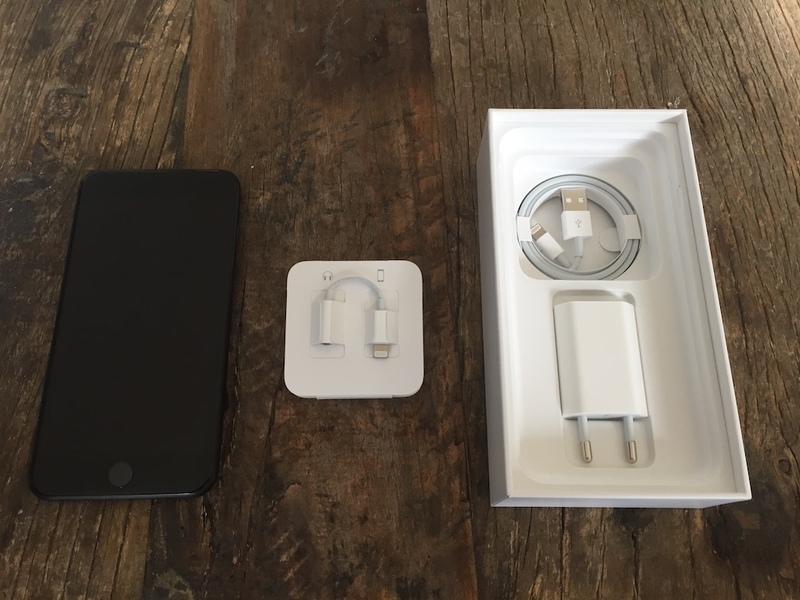 Sinds de iPhone 6s is er een nieuwe – met hardware ondersteunde – feature gekomen. De zogenoemde ‘raise to wake’ functie. Deze functie maakt de eerste keer indrukken van de homeknop overbodig omdat het scherm nu automatisch activeert als je de iPhone oppakt en naar je gezicht kantelt. De raise to wake maakt het bekijken van het lockscreen ook mogelijk, zonder een knop in te hoeven drukken. Met deze functie gebruik ik dus ook meteen het lockscreen meer dan ik op mijn iPhone 6 deed onder iOS 10. Daar kan ik heel kort over zijn. De iPhone 7 Plus is echt waanzinnig snel en responsief. Van een inactieve naar een actieve iPhone waarna je een app opent, maar ook tussen apps switchen, alles gaat erg rap. Het snelheidsverschil is enorm met de iPhone 6. Het gebruiksplezier is hierdoor verder vergroot en maakt dat ik minder snel naar mijn Macbook grijp om wat complexere zaken te doen. Hoewel niet nieuw; ben ik wel blij met deze feature. Het drukgevoelige scherm voegt in mijn ogen echt wat toe in vergelijking met mijn oude 6. Tal van apps bieden extra mogelijkheden of short cuts waarmee je vanaf het app-icoon zelf rechtstreeks toegang tot krijgt. Er is wel één maar. Als je icoontjes wilt reorganiseren op het homescherm dan moet je zonder 3D Touch de homeknop vasthouden. Ik constateer dat ik snel toch te hard druk waardoor ik de 3D Touch functie activeer in plaats de welbekende wiebelende app-icoontjes. Apple heeft met deze iPhone 7 de keuze gemaakt om geluid in stereo weer te geven. Dit door de onderste luidspreker aan te vullen met de luidspreker waar je normaal je oor tegenaan houdt tijdens telefoongesprekken. Hoewel echte stereobeleving in mijn optiek heel lastig is als twee luidsprekers zo dicht op elkaar staan, constateer ik wel beter geluid dan ik van de iPhone 6 gewend ben. wongen van de Watch. Na het ontkoppelen kan je dezelfde stappen ondernemen als je die eerder al gewend was om te koppelen aan jouw nieuwe iPhone. Er is wel één grote maar: de reservekopie bevat niet de bewegingsanalysedata die de Watch/iPhone hebben opgedaan door al jouw workouts. Je zal dus opnieuw de Watch moeten gaan kalibreren. Dit doe je door de eerste keren dat je gaat (hard)lopen naast de Watch ook jouw iPhone mee te nemen zodat GPS-data samen met de bewegingsdata van de Watch kunnen resulteren in een nieuwe analyse van jouw bewegingspatroon. Ik meen ergens gelezen te hebben dat het niet backuppen van de bewegingsanalyse een bewuste keuze van Apple is omwille van de privacy. Dat zullen ze dus niet gaan fixen in de toekomst. Het probleem lost zich overigens bij de Watch series 2 op doordat deze zelf GPS ingebouwd heeft. 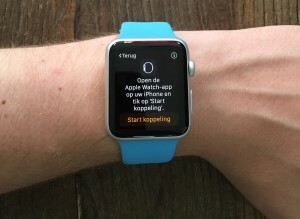 Het handmatig kunnen maken van een Watch-reservekopie zal naar verwachting wel zijn weg in de Watch-app op iOS vinden. Zoals je hierboven al kunt lezen ben ik overwegend zeer positief over mijn nieuwe aanwinst. Ik snap alle ophef over dat Apple onvoldoende innoveert niet enkel omdat deze iPhone uiterlijk weinig verschilt van de vorige twee generaties iPhone. Onder de motorkap is er zeer veel veranderd aan de iPhone en dat merk je aan alles; snelheid, accu, fotokwaliteit, schermkwaliteit, geluid etc. etc. Ik constateer dat ik echt een wezenlijk andere telefoon nu in gebruik heb dan de iPhone 6. En dat verschil is niet enkel aan het grotere scherm toe te schrijven. Voor diegenen die een iPhone 6s hebben is het verschil denk ik te klein om de overstap te maken. Maar als je een iPhone 6 of ouders hebt en overweegt om de aanschaf te maken is mijn advies; twijfel niet! Koop hem en je zal er niet door teleurgesteld raken. Twee dagen geleden ontving ik per post mijn Apple Watch; een dag eerder dan Apple Store-website voorspelde. Na 3 dagen aan ervaring geef ik een overzicht van mijn eerste bevindingen van de Apple Watch..
Ik worstelde al ruim voordat de Apple Watch in Nederland beschikbaar kwam al met de vraag of ik een Apple Watch ging kopen. Al vele jaren draag ik een mooie klassiek vormgegeven automaat om mijn pols van Christopher Ward, waarmee ik nog steeds regelmatig complimentjes oogst. Hoe blij ik met dit horloge ook ben, toch kleven er enkele nadelen aan dit horloge. Het is een zwaar en niet heel precies uurwerk. Regelmatig moet ik de tijd enkele minuten weer corrigeren. Gezien mijn dagelijks gebruik van het openbaar vervoer is een hele precieze tijd belangrijk. De wens om een preciezer horloge leefde al enige tijd. Ook loop ik hard een aantal keer in de week. Een automaat met leren band is dan niet ideaal. Voor het hardlopen gebruik ik mijn iPhone i.c.m. Runkeeper. Met korte broek en hardloopshirt heb ik liever een horloge dan een iPhone bij me. Daarom kocht ik vorig jaar een Garmin GPS-sporthorloge. Nadeel van dit horloge is de (vaak) lange tijd voordat er voldoende GPS-signaal was om te kunnen starten met hardlopen. Ook het synchen tussen horloge en Runkeeper vereist de nodige extra handelingen. In de praktijk verkies ik daarom nog steeds de iPhone (in een zweterige sportband om de arm) boven de Garmin. Ahh… Yosemite 10.10.1 geïnstalleerd en continuity doet het niet meer!! Vanavond heb ik als zovelen direct de nieuwe update 10.10.1 geïnstalleerd op mijn Macbook Air. Omdat ik een Macbook Air mid 2011 heb, beschikte ik niet ‘out of the box’ ondersteuning voor Continuity toen ik Yosemite enkele weken geleden installeerde. Dankzij de in mijn eerdere post genoemde Continuity Activation Tool krijg ik het met softwarematige aanpassingen alsnog (naar tevredenheid) aan de praat. De update naar 10.10.1 heeft helaas de softwarematige aanpassingen weer teniet gedaan. Ik durf nog even niet de tool opnieuw te draaien omdat ik nog geen ervaringen hierover heb gelezen. Iemand al ervaringen mee of de tool nog correct werkt onder 10.10.1 en Continuity opnieuw werkend krijgt?